There is nothing more stressing than getting lost while on your way to your dream destination. Imagine you are on self drive safari or even guided tour to Bwindi Impenetrable Forest National Park and along the way you drive for kilometers off road and only to be told that you got lost. Not only can this be a waste of time but also a waste of money a fact that fuel will be consumed to return to the right route. Bear in mind that there is no one who is perfect on the road so, if you are planning to spend your next vacation in the splendid Bwindi National Park, there is need for you to be well versed with different routes. 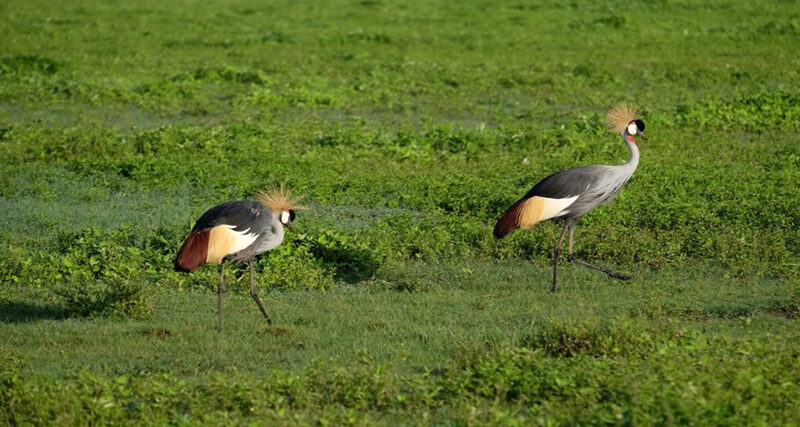 This park is located in southwestern Uganda and it is about 8 to 10 hours’ drive from Kampala which also 46 kilometers from Entebbe International Airport that is a major entry point to Uganda. If you are planning to spend a holiday in this park, you will need at least 3 days and more a fact that you will spend an entire day driving from Kampala and the next day will be for you to engage in various activities at the park. However, if you are from the neighboring Rwanda, 2 days are enough to get to Bwindi and take park in the gorilla safari adventure. This route is from Kigali Airport to Kisoro town through Cyanika boarder or Kabale town through Gatuna boarder. Bwindi National Park can be reached by road and air. If you opt to drive, you will choose among the many routes that take you up to the park. If you are at Queen Elizabeth National Park for a tour, you can drive from Mweya to Bwindi approximately 160 kilometers’ drive and you will spend at least three to four hours driving. Equally, you can start your safari from Kampala to Kabale via Kanungu to Buhoma area and this is tarmac route and covers over 414 kilometers. The other route also starts from Kampala to Ntungamo to Rukungiri and then to Buhoma area approximately 390 kilometers’ drive on tarmac and 82 kilometers on murram route. You may as well as set off from Kampala to Kabale to Ruhija to Buhoma about 95 kilometers and the other begins from Kampala to Kabale to Nkuringo sector. 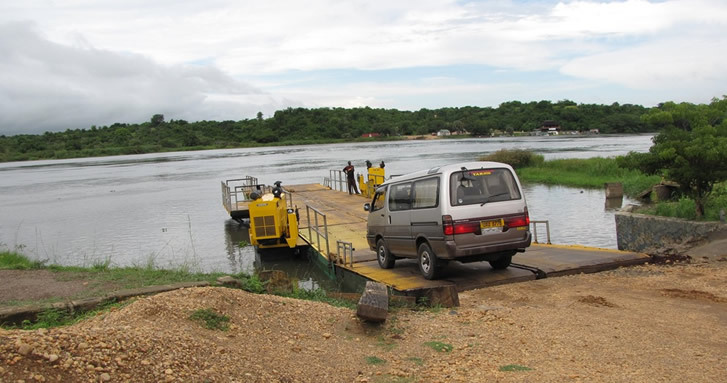 Alternatively, you can use a bus from Kampala to Butogota where you will rent a taxi that will connect you to Buhoma sector. However, you won’t find a public transport means at Nkuringo but there are some cars for you to rent around Kisoro and Kabale towns. But to be on safer side, it is better that you plan your vacation with a recognized travel agent which is well versed with routes and attractions for you to enjoy along the way. For those of you who have short time in Uganda, then a flight is the best option for you. You can take a flight from Entebbe International Airport and Kajjansi Airfield and then land in Kisoro or at Kayonza airstrip if you are to track gorillas in Buhoma area. If you are tracking gorillas in Southern Bwindi National Park (Nkuringo or Rushaga sectors), then you fly to Kisoro airstrip. Aerolink Uganda offers daily scheduled flights from Entebbe International airport to different airstrips in Uganda such as Kihihi, Kisoro, Pakuba, Apoka and Bugungu among others. There are also charter flights offered by Kampala aero club. The beauty of Rwanda is not only mountain gorillas, the big five animals, antelopes and bird species but also the numerous water resources including Lakes, Rivers and waterfalls that have remained unexplored because few tourists know about them. If you ask anyone to mention some of the common rivers in Rwanda, you will surprisingly not hear about the Rusizi River yet it’s one of the most beautiful water resources in the country. This 117-kilometer long River is sometimes spelled “Rusizi” and flows from Lake Kivu to Lake Tanganyika in Central Africa while descending from about 1500 meters/4900 feet above sea level to only 770 meters/2530 feet above sea level over its length. The river drains across three countries-the Democratic Republic of Congo, Burundi and Rwanda but its source is in Lake Kivu and mouth in Lake Tanganyika. The most perpendicular bank of the River occurs over the first 40 kilometers (25 miles) where hydroelectric dams were constructed. When getting closer to the mouth, the Ruzizi Plains (the floor of the western Rift Valley are surrounded by gentle hills making the river to flow into Lake Tanganyika through a narrow delta with one or two tinny channels breaking off from the main channel. The Ruzizi River has several tributaries that include Rubyiro, Luvungi, Muhira, Nyakagunda, Ruhwa, Kaburantwa, Nyamagana, Mpanda, Kagunuzi and many others. Formed about 10,000 years ago through volcanism that led to continental rifting and creating of Virunga Mountains, the Rusizi River is considered a young river. The Virunga Mountains blocked part of Lake Kivu’s outlet to the watershed of River Nile, hence forcing the Lake to overflow southwards down Ruzizi and the watershed of the Congo River. Along its course, the river forms the border between Rwanda on the East with Democratic Republic of Congo on the west but as it continues downstream, it also forms part of the boundary between Burundi and the Democratic Republic of Congo and its lowermost part flows completely within Burundi. To the west, the magnificent Fizi Baraka Mountains stand over the river while the Bridge of Concord, Burundi’s longest and widest Bridge crosses the River close to its mouth. Ruzizi is not just a river as you may see it but an important habitat to the prominent, notorious and widely publicized man-eating crocodile known as “Gustave” that usually wanders around the banks of the river as well as the northern shores of Lake Tanganyika. This giant savage is said to be about 6 meters (20 feet) long and reportedly weighs over 900 kilometers (2000 pounds). In the 1950s, the banks of this River were inhabited by common warthogs, buffaloes and elephants but today, there are only Nile crocodiles and Hippos. The lower banks of the main river and its tributaries are covered by reed swamps and there are riparian swamps of about 3 kilometers wide are found near the mouth while further from the river, there are grasslands especially in the lower river valley. 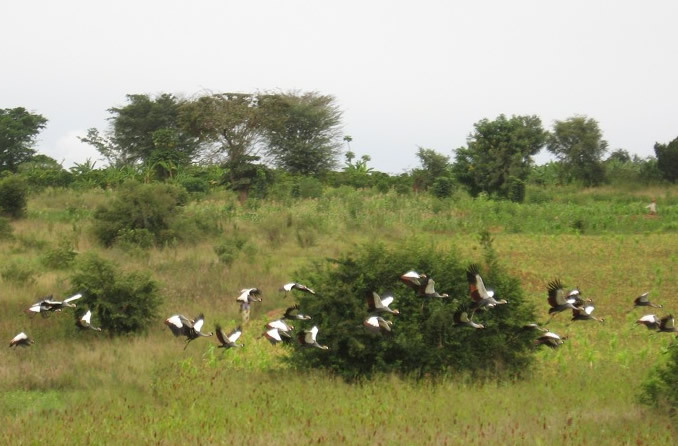 The general vegetation of the River basin is mostly savannah grassland with scattered acacia, eucalyptus and oil palm. Ruzizi River is only 353 kilometers from Kigali City (Rwanda’s Capital). Hiking is a typical adventure experience in Uganda that is quite unique & interesting for anyone to get involved while on a vacation. Mountain Rwenzori is a world heritage site that otters the opportunity to see nature and its best. Due to its numerous peaks with the highest peak at 5,109 meters which is Margherita. 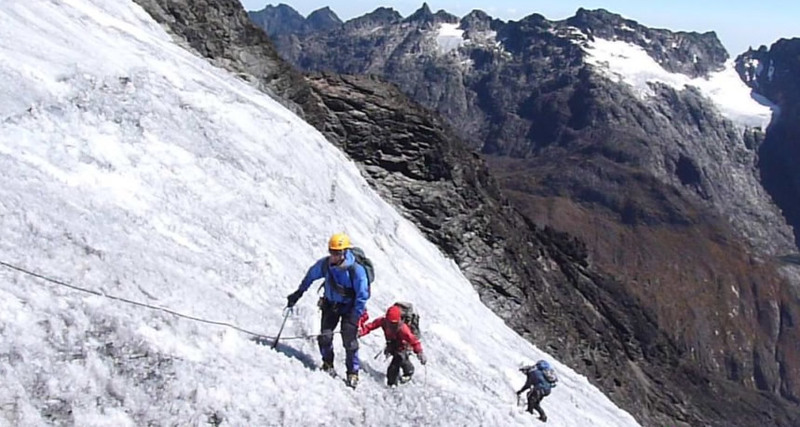 Margherita is the highest peak of mountain Rwenzori. It’s the third highest mountain in the whole of Africa. It has a unique, fantastic and a true beauty that offers unremarkable hiking experience in Uganda with clear view of eastern DR Congo when on top. Margherita is the third highest peak in the whole of African and the highest in Uganda; its real beauty with the climb up through Kilembe route, the forest ,valleys and the diversity of flora and fauna gives a tourist unforgettable experience. Hiking is one of the best activities that Margherita offers to all the visitors who are interested in testing their physical fitness. Hiking to Margherita peak take a couple of days, between 7-9 days according to the physique and speed of the hikers. Though the hike involves unique activities like walking through the forest, climbing the rocks, viewing birds and the animals that can be spotted within the Montane forests, for pleasure and exercise, starting from Kilembe up to the top of Mt. Stanley where the highest peak Margherita can be sighted. Hiking Mountain Rwenzori down slopes via Bwamba pass inBundibugyo. Before a road was built in 1938 to link fort portal with the remote town of Bundibugyo, local people followed the most direct route between these settlements -a tough 1500m high trek over steep north Rwenzori ridge, known as the Bwamba pass. 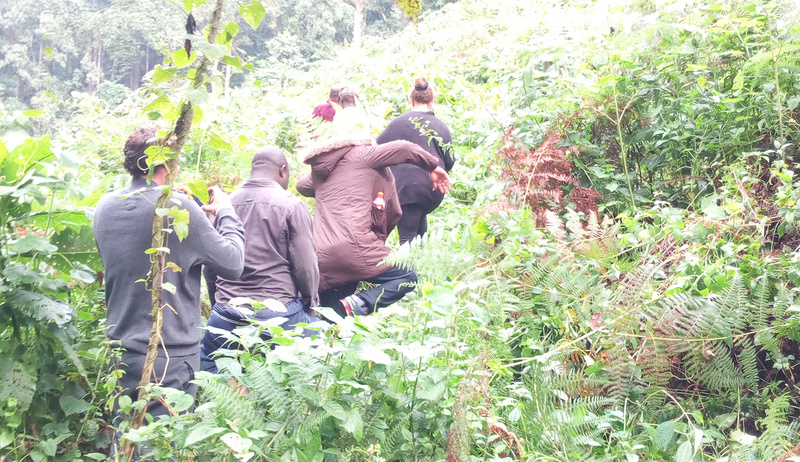 The Abanya Rwenzori community group leads the hikers over the mountain through isolated mountain villages to visit the bamboo forest and enjoy superb rift valley views. Mt. 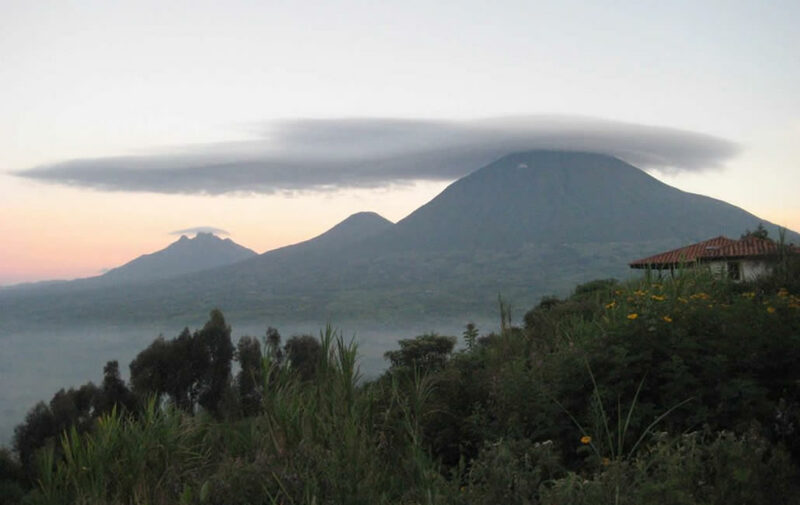 Elgon lies at an altitude of over 4000m above sea level with the largest volcanic base in the world. Located on the Uganda-Kenya border it is also the premier and largest solitary, volcanic mountain in East Africa. Its vast form, 80km in diameter, rises more than 3,000m above the neighboring plains. The mountain’s cool heights offer respite from the hot plains below, with the higher altitudes providing a safe haven for the growth of flora and fauna. 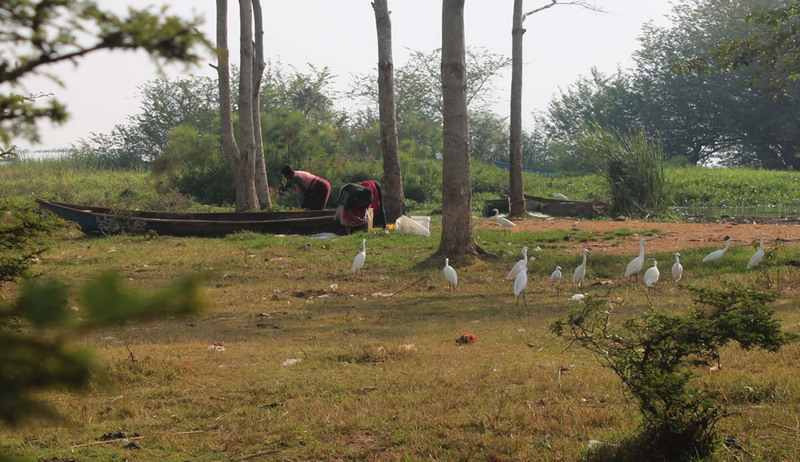 This conservation area is a habitat of over 300 species of birds, including the endangered Lammergeyer, mammals including Small antelopes, forest elephants,monkeys and buffaloes which dwell on the mountainside. A hike on Mt. Elgon’s deserted moorlands discloses a magnificent and un-clustered wilderness without the summit-oriented approach common to many mountains: the ultimate goal on reaching the top of Mt. 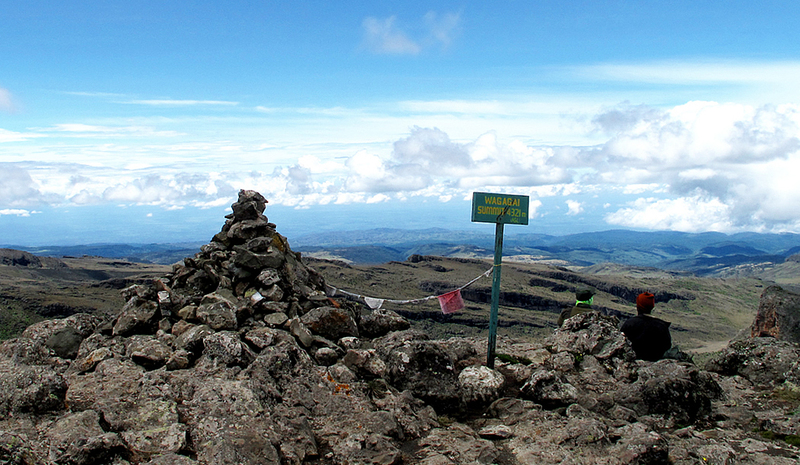 Elgon is not the final ascent to the 4321 m Wagagai Peak, but the descent into the vast 40 km² caldera. In Semuliki national park there are 3 hiking trails, Kirumia trail and this runs through the heart of the forest to Semuliki river and this one is really perfect for birders, red monkey trail goes to the park’s eastern border and in this place your assured to view the rare deBrazza’s monkey, Sempaya trails and in this trail u will view the male hot springs and female hot spring, dominated by boiling geyser. Eggs and Matooke (green plantain) can be cooked in these boiling waters and enjoyed by hungry hikers. This is an extinct volcano found in Kisoro, and one of the Virunga Mountains, lying across the border between Rwanda and Uganda. It’s the third (3rd) highest mountain of the eight major mountains in the Virunga ranges reaching up to 4,127m (13,540 feet). Hiking Mt Muhabura in the south western Uganda is so adventurous and the place is worthwhile visiting to enjoy such amazing hike on this mountain. It feels great walking through the beautiful varying terrains that often looks like a desert, viewing at the open slopes; you see a beautiful cover of thick shrubs and thickets of a broad spinned of evergreen plants. Other hiking opportunities in Uganda’s national parks. Hiking in Lake Mburo national park is at Rwonyo, a trail leading to salt lick where many animals are attracted to salty rocks. Walk on the western side of the lake, and encounter hyenas returning to their dens and hippo retreating to the lake. Hikes via the woodland in Lake Mburo gives you a chance to sight birds, mammals, and walking to the top of the hill rewards hikers with a spectacular view of the region’s 14 lakes. 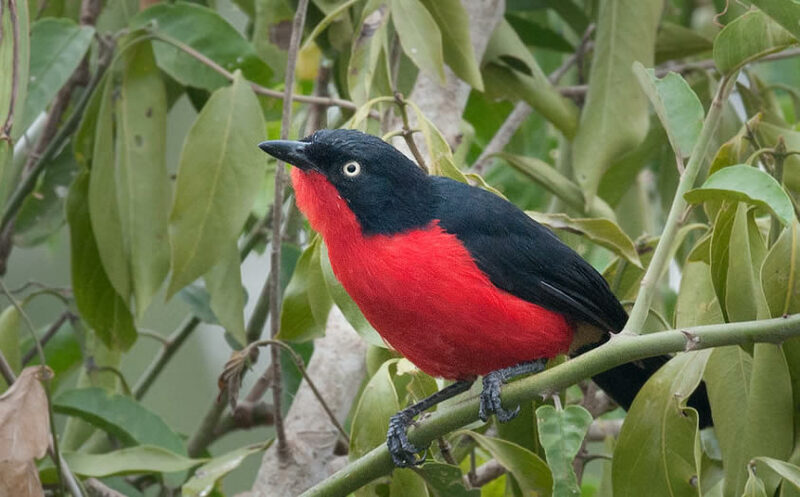 Hiking through the jungles of Mgahinga Gorilla Park to the low Mount Sabinyo gorge-a heavy gash on the side of mount Sabinyo, gives excellent birding opportunities and the chance to find the rare Rwenzori turaco. Trekkers can sight the calderas on top of the Gisozi hill, look out for Kisoro, Bunagana town and be captivated by Lake Mutanda. Hiking through woodland to the top of Murchison falls is completely different experience of this magnificent waterfall. This is an experience that brings all the sense into play; waves of white water fall hypnotically through this 6 meter gap, listen to loud sound, taste the spray on your face and feel the rock shake beneath your feet. 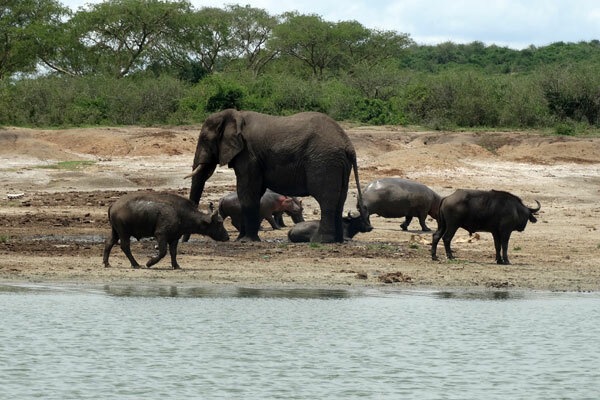 Hiking on Mweya peninsular offers savannah and woodland with beautiful views and bold warthogs. 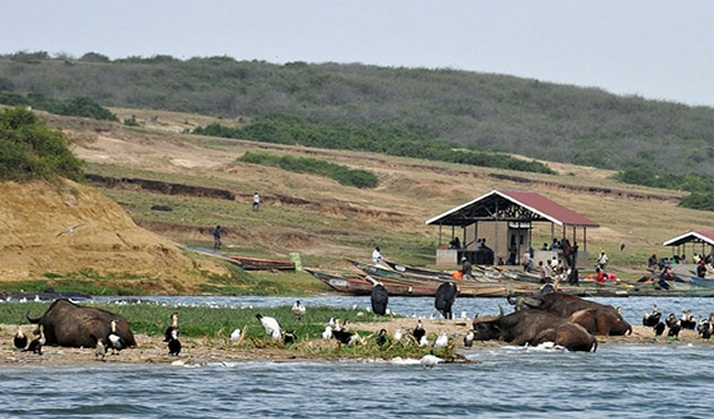 On the southern end of park, hikers can enjoy an easy stroll along Ishashaa river, where they can spot a variety of forest and savanna bird and mammal species as well as having a unique opportunity on this hike to get extremely close to hippos on foot, while remaining safe on the raised bank above the river. Virunga national park has for years been battling with political strife and civil insurgencies and hostility from resident rebel groups in the forest. However with the recent peace and calmness in the region, tourism had gradually picked up and the park was flourishing once again in many years. However the kidnappings of May 11th posed yet another great state of insecurity towards travelers as never before, making it the first ever direct attack targeting the tourists. In a similar manner, 6 park rangers were robbed of their lives while on duty in the park’s most remote section when they fell in an ambush of purported militia rebels, known as Mai Mai who are known to reside in this forest. 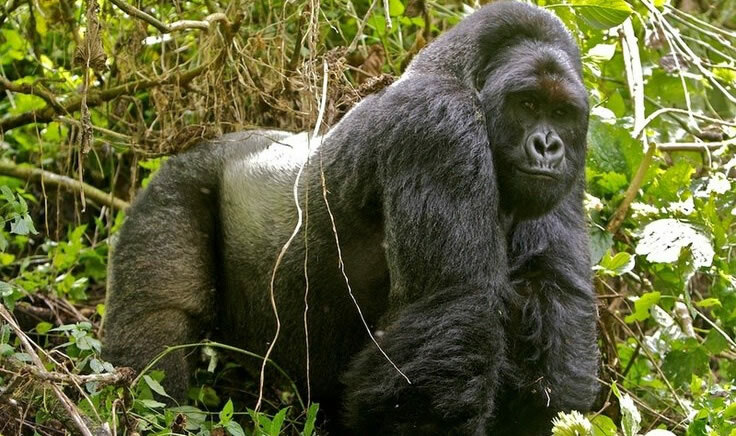 The park authorities have then considered suspending and halting all tourism activities in Virunga national park following the 11th May kidnap of 2 British tourists, driver and the park ranger who was later killed. The Virunga park authorities announced the indefinite suspension 3 days later after release of the tourists on 15th May 2018; however reports on when the park will reopen are still undisclosed as security conditions still remain fragile. The kidnaps took place on Friday 11th May 2018 in the Nyiragongo territory, north of Goma and the female ranger aged 25 was shot and she died shortly after admission in a nearby hospital. The U.S State Department listed D.R. Congo at Level 3 on their four – level travel advisory list, advising American travelers to “reconsider travel” to the central African country due to “crime and civil unrest”. All travelers who had booked their trips to Virunga national park are urged to get in touch with their booking agents and discuss alternative journey or cancellation will full refund. 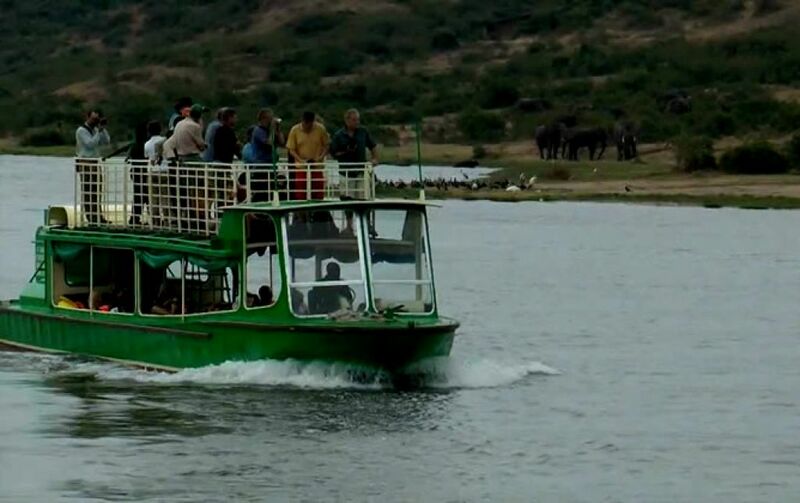 Many travel agencies have already offered refunds to clients who considered cancellation, while others are offering alternative trips to the neighboring Uganda and Rwanda for gorilla trekking and wildlife tours. This unexpected closure removes Virunga conservation area, one of Africa’s premier and oldest treasures from the travelers’ list. In 2014, its southern section was the first to be reopened to travelers, however security has never been fully guaranteed as rebels have continuously showed up on different occasions. Groups of armed militia known as Mai-Mai still operate in the park’s interior, exploiting its water bodies, forests, and wildlife. Five rangers and their driver were killed in a single attack by these militia groups earlier this year in April. Virunga National Park, also known as Parc national des Virunga is a popular protected area and Africa’s oldest and largest national park, which covers 3,000 miles, located in the Virunga region and home to an extended chain of 8 mountains spanning Uganda, Rwanda and D.R. Congo. 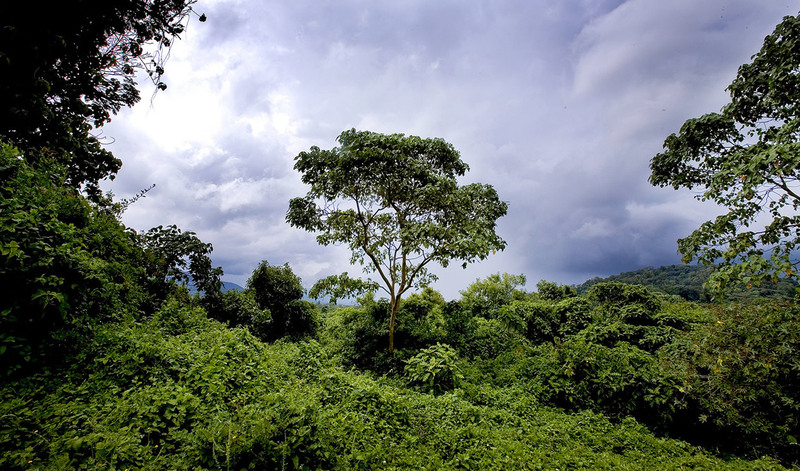 This park is a significant conservation area which shelters more than a quarter of the world’s endangered mountain gorillas and the eastern lowland gorillas, buffaloes, elephants and abundant bird-life. Virunga national park has seen a rise in her visitor population since 2004, and for 4 years since it was reopened the numbers have been growing magically from almost none to 100,000 last year. As a result, the park now funds its annual running costs typically from tourism revenues which amount to $10m and this covers 6 aircraft, a rapid-reaction force, 800 rangers, intelligence operation, 24 hour operation Centre and canine unit. Travel risks in Virunga national park. 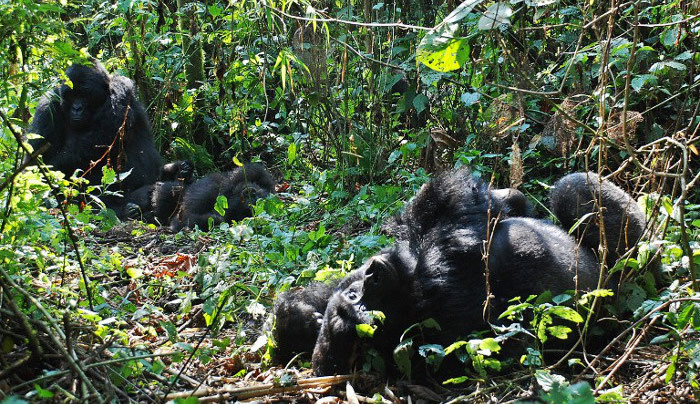 In the recent past, Virunga national park had gained significant popularity and stability, but resistance and threats posed majorly by poachers and militia groups whose target are park rangers have failed to seize. For the last 20 years, a total 170 rangers have lost their lives in the hands of either militia groups or by poachers. Currently, poachers are still active in the park, charcoal industry who felly trees and those interested in oil exploration. Travelers remain vulnerable if moving without escorted transportation in region of Goma and other parts of Eastern D.R. Congo and the “risk of injury and kidnap as a result of armed groups and criminal activity remains high”. How old do I need to be to hire a vehicle in Uganda? Provided that you are above 20 years with a valid driving license /permit, you are free to rent a car for self drive trip in Uganda. At least have about four years driving experience in case you need to get on the road on self drive to catch a glimpse of many tourist attractions in the country. Booking a car in Uganda can be done through online by filling in the short form or simply send an email directly and the other alternative is for you to book by visiting the company’s office itself. What is the cheapest vehicle for self drive in Uganda? A self drive safari in Uganda is best when you take a 4×4 safari vehicle that can navigate through the terrains and all kind weather conditions in the remotest areas where most attractions are found in the country. You can make your choice along Land Cruiser Prado, Safari Land Cruiser, Toyota Rav4, Nissan Patrol, Super Custom and Safari Minivan. Why go on self drive trip in Uganda? 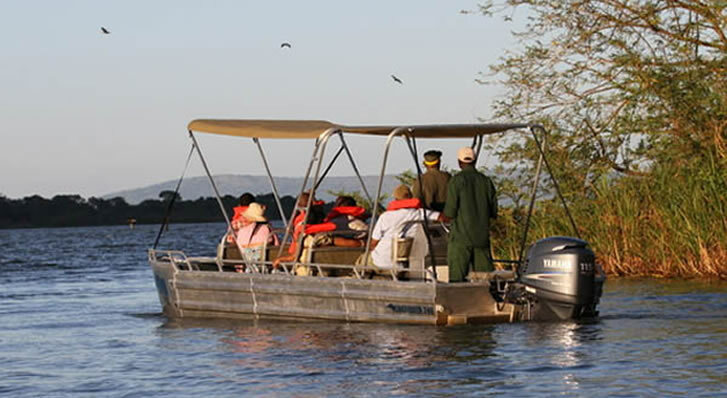 A self drive tour in Uganda gives visitors that total freedom, flexibility and convenience to make any decision on where they want to visit and what they wish to view and explore at their own time. Can I pre book or book a car up on arrival? By pre booking a vehicle for safari you stand to get some benefit of purchasing power. Rates for self drive car hires are minimal and fit within the visitors pocket range. It is better to pre-book in advance to avoid disappointments at the last day. An international driving permit is a proof that you have a valid license in your home country at the date of issue of the IDP. This should come along domestic driver’s license. Do I require any travel insurance? You need to take travel insurance and it better for safari holidays in Uganda. This will cover issues of accidents or theft of the cars. Where do I pick up the rental car? Visitors can pick a car rental at agency offices, airport or any other specific place that will be agreed upon booking. A driver and representative from car hire company will deliver the vehicle within the shortest time possible and once you land in, you simply walk in and you will be handed over the keys to start your ride. Can I drop off the vehicle at different location? Yes, you can drop the car to another location but must be agreed on with the car rental company, and some times, this happens at a fee. For example, if you started your trip in Kampala and you want to drop the car in Mbarara, you will be charged for fuel and driver to return the car to Kampala. This fee is negotiable between the hirer and car rental agency. What car hire fuel types are there? We have petrol and diesel fueled vehicles and you choose the one which is best for you. 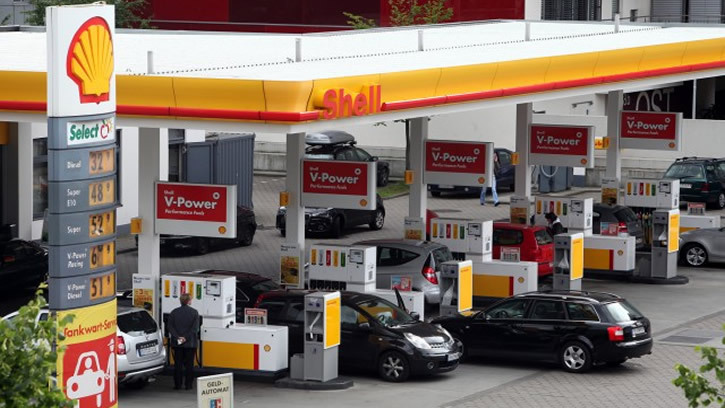 The rates also differ based on the fuel type. What is the fuel policy for hiring the vehicle in Uganda? 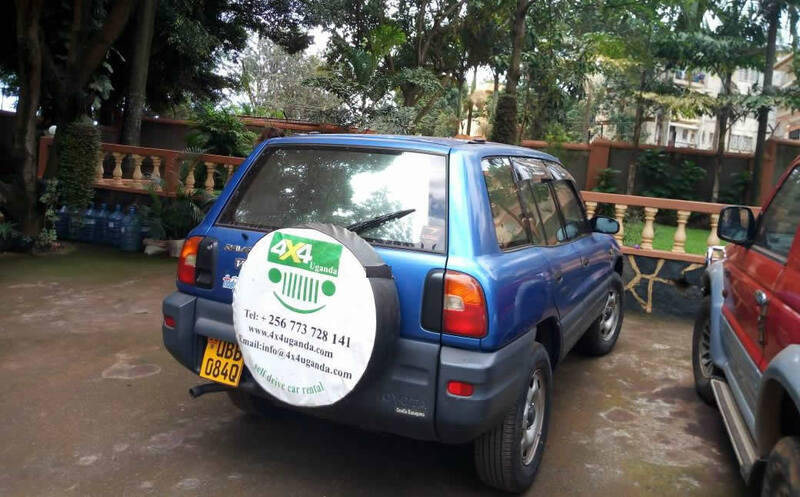 Most car rental agencies like 4×4 Uganda Ltd and Rental Cars Uganda Ltd offer quarter tank vehicles and expect it to be returned to us in the same way and if the vehicle is brought back when it is less than quater tank, you will incur an extra cost to repay for the missing fuel capacity. And there is no refund for unused fuel. Self drive cars offered depending on unlimited mileage meaning that you visit the area provided you incur the cost of fueling the car yourself. What if I brought back the vehicle late? In case you brought the vehicle some hours late on the last day, you won’t be charged by most car rental companies in Uganda but in case you make a mistake of bringing it a day after, then expect an extra cost for the similar amount that you paid each day. We encourage our visitors to always contact our reservations group and let them aware about your interest the number of car hire days as you may even get some discount on it. In conclusion, when it comes to car hire services for self drive safaris in Uganda, we offer variety of cars within visitors travel interest and we able to respond to any other inquiries a visitors would like to get clarification. Enjoy your trip.